16 March 2010, at 8:42p.m. 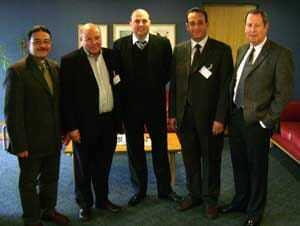 LIBYA - Aviagen recently welcomed delegates from Libya's largest private sector chicken business, Golden Poultry, to Scotland. Golden Poultry are a major Ross customer in Libya which is one of the fastest growing markets in North Africa. Dr Mustafa Eteer, President, and Ahmed Omar Baheg, General Manager, met with the Ross team and senior staff from Aviagen to discuss their ambitious expansion plans aimed at making Golden Poultry the premier poultry company in Libya within two years. John Maguire, Ross Sales Manager, commented: "We were delighted to welcome Golden Poultry to the UK for the first time. This was a fantastic opportunity to exchange ideas and discuss how we can continue working together. It has also allowed us to develop together our joint strategy for Golden Poultry’s future market expansion plans. This spirit of partnership is something we identify with very strongly and want to continue to develop. Our colleagues in Scotland organised a first-class visit and as always were excellent hosts. "Among other things, we were able to tell Golden Poultry about the success of Ross products worldwide. The Ross 308 has all the right credentials and strengths for the Libyan market. It's a bird which performs extremely well at all levels in the local environment as it exhibits all the characteristics which has made the Ross 308 the breed of choice everywhere." Dr Eteer said: "This was a great opportunity to meet Aviagen specialists and to discuss the future needs of our growing business. We were pleased by the quality and depth of the presentations, which gave us a real insight into the Aviagen business and the people behind the success of the Ross brand. "We appreciated the opportunity to meet with Aviagen personnel in order to understand the direction of the Ross breeding programme and make them aware of our specific needs."